EXCLUSIVE: New Book by Ann Coulter is a personal memoir! We have obtained an advance copy of Ann Coulter’s latest top secret book. The nine-time New York Times best-selling author is soon to publish a memoir revealing her innermost thoughts and feelings. The beloved and despised “conservative” polemicist and “Christian” provocateur talks candidly about herself and her aspirations. 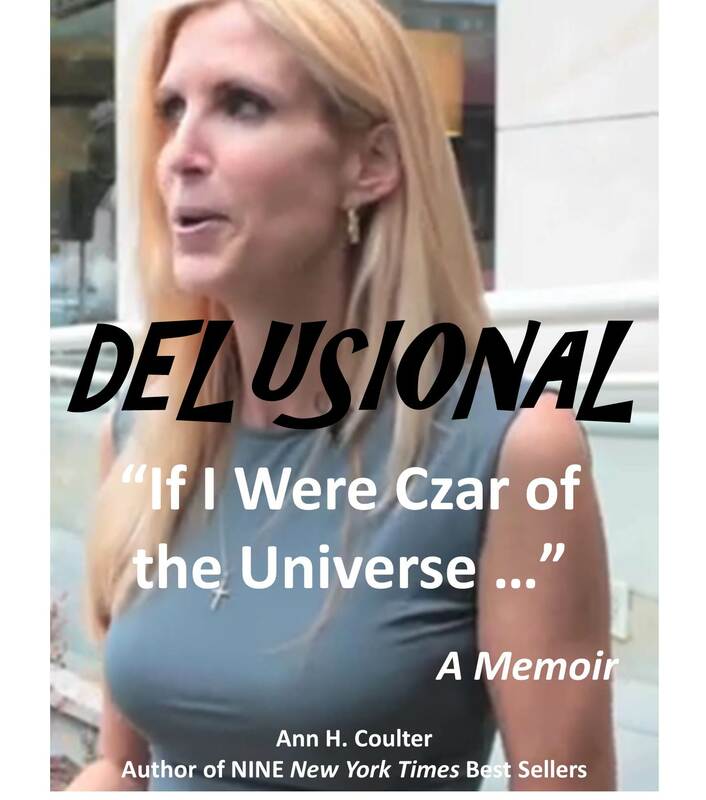 In Delusional, you will discover the heart and soul of Ann Hart Coulter, who wants to be both a star and a czar, as she reveals her innermost self-perceptions, regardless of how divergent they are from reality. 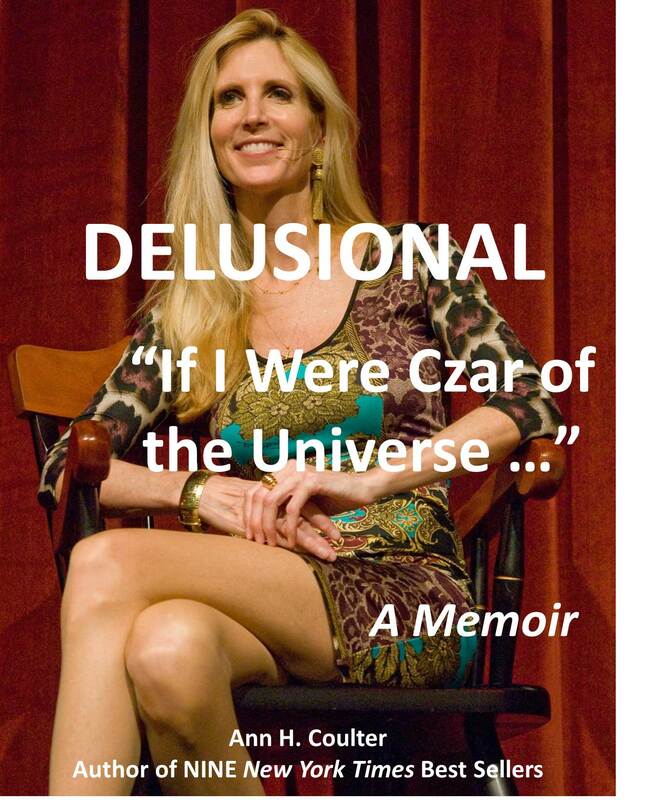 Among Coulter’s many whimsical fantasies about herself are her claims to be “more libertarian than most libertarians,” “more Tea Party than most tea partiers,” “totally pro-life,” and “an extraordinarily good Christian.” Yes, she even wants to be “czar of the universe,” despite acknowledging the totalitarian nature of that rank. Here are some extracts for your amusement and edification. Get ready to be captivated by the pundit who is captivated by herself! All quotes are direct quotes from Coulter – vintage Ann Hart Coulter. 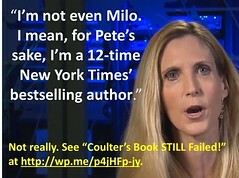 For additional Ann Coulter identities, see “Ann Coulter’s Crazy Funhouse Mirror” at http://wp.me/p4jHFp-8n. Ann Coulter, Scarborough Country, MSNBC, 7/7/03. Ann Coulter, Politically Incorrect, ABC, 3/12/99, and Ann Coulter, Leadership Seminar, Clare Booth Luce Policy Institute, 6/12/00. See Vanity: Ann Coulter’s Quest for Glory at www.coulterwatch.com/vanity.pdf. Ann Coulter, Leadership Seminar, Clare Booth Luce Policy Institute, 6/12/00. Ann Coulter, Politically Incorrect, ABC, 3/12/99. Ann Coulter, “Disgusting doesn’t make it ‘speech,’” 8/1/01. Ann Coulter, “National Lampoon’s Florida Supreme Court Vacation,” 12/6/00. Ann Coulter, Booknotes, C-Span, 8/11/02. Ann Coulter, “I’d Burn My Neighbor’s House,” 9/15/00. See The Beauty of Conservatism at www.coulterwatch.com/beauty.pdf. Ann Coulter, Robert Ringer.com, 11/6/09. Ann Coulter, Piers Morgan, CNN, 2/11/14. Annys Shin, “Blonde Ambition on the Right,” National Journal, 5/31/97. 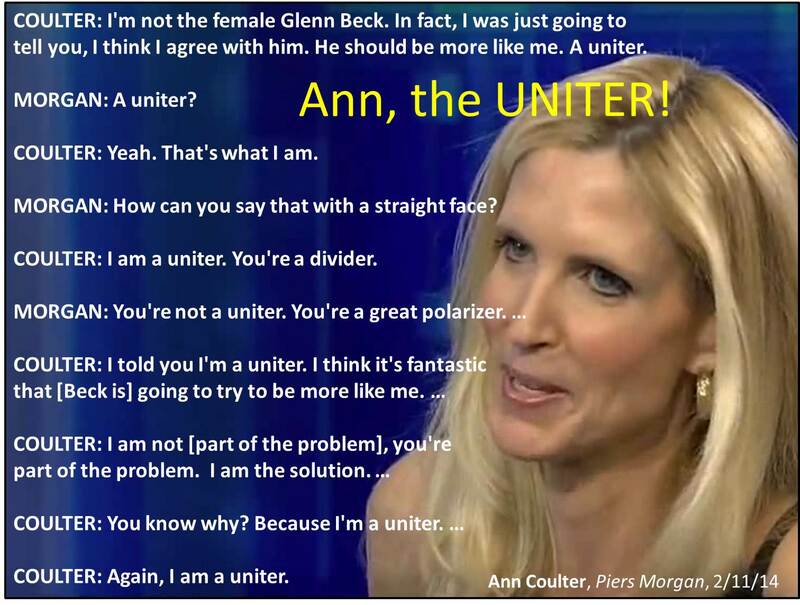 Ann Coulter, Stossel, FBN, 2/21/13. Ann Coulter, Mid-Day LA, KABC, 5/28/14. Ann Coulter, “Black People the Media Hate (and Rand Paul Isn’t Wild About),” 12/3/14. Ann Coulter, Freedom Watch, FBN, 5/6/11. Ann Coulter, Fox & Friends, FNC, 11/2/14. Ann Coulter, “My Pre-Recrimination Election Analysis, 11/3/14. 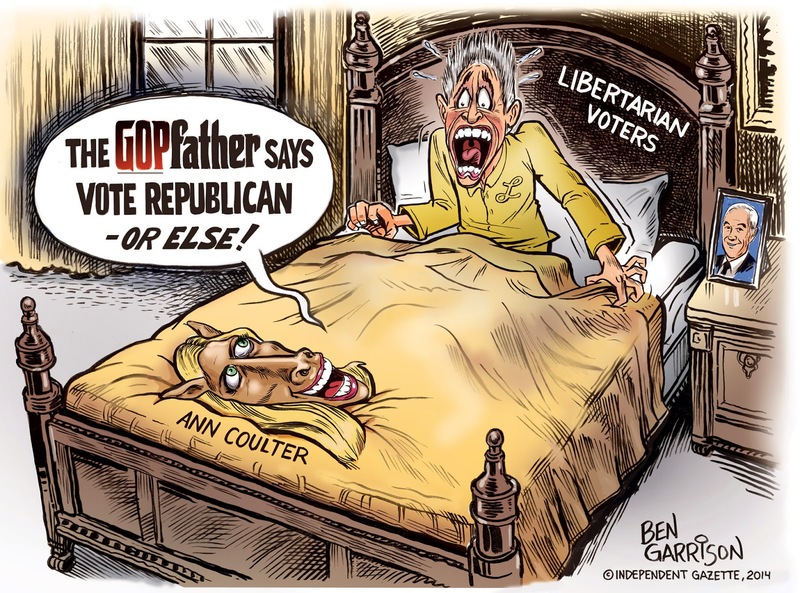 Ann Coulter, “Voters Are Giving You One More Chance, GOP,” 11/12/14. “Ann Coulter: The ‘Never Trust a Liberal over 3’ Interview,” Kam Williams Show, 11/18/13. “Ann Coulter on Winning: Political pundit Ann Coulter discusses the importance of winning elections over simply maintaining ideological purity,” Byline with Brian Lilley, Sun News, 11/29/13. Ann Coulter, Ft. Myers, FL, 12/21/13. Ann Coulter, Los Angeles, 11/10/13. Ann Coulter, Eagle Forum Collegians Leadership Summit, 7/11/14. Ann Coulter, “A Tough Night at MSNBC, 11/5/14. Ann Coulter, Red Eye, FNC, 2/5/13. Ann Coulter, O’Reilly Factor, FNC, 6/22/09. 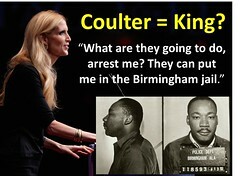 Ann Coulter, “W.W.J.K. : Who Would Jesus Kill?” 3/10/04. Ann Coulter, Columbia Spectator, 12/5/01. Ann Coulter, AOL interview, 7/14/06, http://books.aol.com/feature/_a/license-to-be-bold/20060717101109990001, audio at http://aolradio.podcast.aol.com/books/aolbooks_anncoulter_071406.mp3. Ann Coulter, Hannity & Colmes, FNC, 6/6/06. Lisa de Pasquale, “Exclusive Interview: Coulter Says Book Examines ‘Mental Disorder’ of Liberalism,” Human Events, 6/6/06. Ann Coulter, If Democrats Had Any Brains, They’d Be Republicans, Crown Forum, 2007, pp. 77-78. Ann Coulter, “The Passion of the Liberal,” 3/03/04. Ann Coulter, O’Reilly Factor, FNC, 10/15/07, http://www.foxnews.com/story/0,2933,302437,00.html. Ann Coulter, website posting, 8/20/14. Ann Coulter, “Liberals Willing to Fight to the Last Drop of Black Blood,” 11/26/14.